If you know me, you would also be knowing that I am a total sucker for colored eyeliners especially the pencil ones because they are more pigmented and easy to apply. Also, many many colors to choose from :). So, today I thought of doing a combined post on all, well almost all the liners that I own. Only while doing the swatches I realised that I have a soft corner for the color BLUE. 1. L'Oreal Color Riche Le Kohl in Portofino Blue (Rs 375) ~ Its a matte blue shade and glides on quite decently but the problem is its not very pigmented. I have to reapply it 2-3 times to get the color of my desire. Also, it did not sharpen evenly, I had used my Lakme Sharpener (see the pictures above). I wont say its not a pretty color but its not my kind of blue. 2. Lakme Glide On Eye Color In Copper (Rs 275) ~ Its a pretty warm copper color. As the name suggests, it glides on easily and is highly pigmented. I just love this liner and will buy it again and again. I think it really suits my brown eyes. Also sharpens easily. 3. Lakme Shadow Artist Shimmer Stick In Glimmer Green (Rs 350) ~ Its a lime green color with golden shimmer. Quite pigmented and really pretty color. 4. Rimmel London Exaggerate Waterproof Eye-definer In Deep Ocean ~ Phew!! Long name :P. A matte dark blue color. I had received this Eye Pencil in my Makeup Swap with Shourima of Makeup,Fashion And Everything I Like . Again nicely pigmented and suits my brown eyes. 5. Chambor Sparkling Eye Pencil in Aqua Star ~ Beautiful sky blue color with silver shimmer. Pigmented and pretty. The only con is, it does not sharpen evenly. 6. Deborah Millano White Kajal in 117 ~ Pigmented. I apply it on my waterline to brighten up my eyes. Does not sharpen evenly. 7. Chambor Eye Dazzle Transferproof Smooth Eye Pencil in Gold Dazzle ~ Pretty gold color. Very pigmented and glides on smoothly. Its quite soft and I had a hard time swatching it. One thing I dislike about this pencil is, it only retracts one way and I have to be really careful while twisting it up. 8. Revlon Magic Eyeliner In Smokey Black ~ One of my favourite liner. Matte dark grey in color. 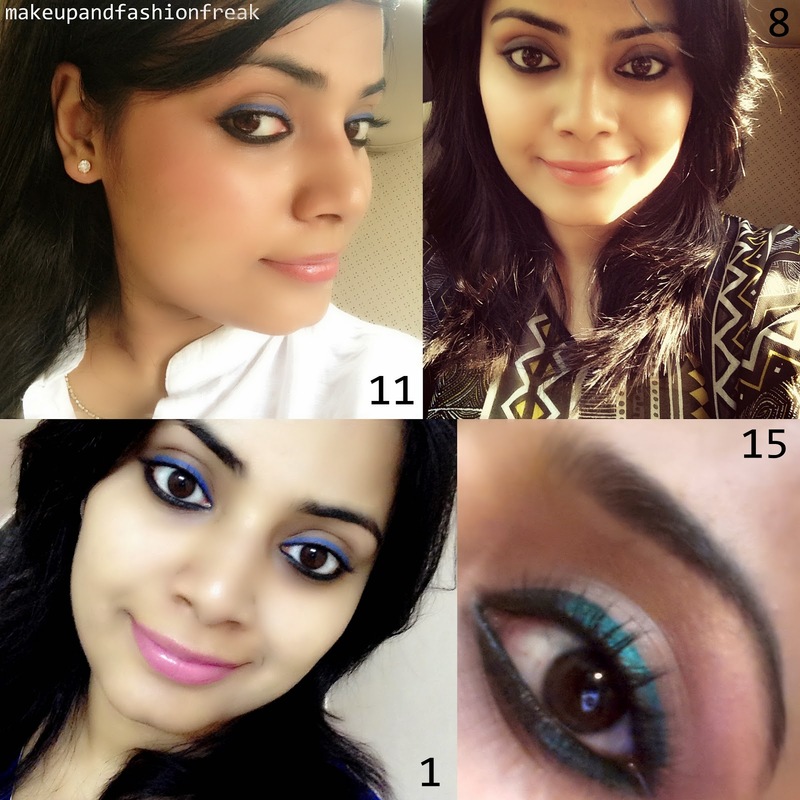 Perfect to create an easy smokey eyes in a jiffy. I just love using this one especially when I am in a hurry. 9. Lakme Glide On Eye Color In Purple ~ Pretty shimmery purple color. Go to 2. to read more. 10. Maybelline Expert Wear in Slate Grey ~ A matte light grey color. I am not so fond of it. I feel it does not suit my brown eyes. 11. Maybelline Vivid & Smooth Liner By Eyestudio ~ Again my favourite. I could not find the shade name on the pencil. Its a dark blue color and glides on smoothly and it very pigmented. 12. NYX Eye Pencil in Silver ~ I had received this in my Vellvette Box. The pigmentation is not that great but not bad too. 13. Faces Eye Pencil in brown ~ A matte brown color, I am not fond of this one. It seems waxy and does not glide on smoothly. I have to go on and on to get the desired results. 14. MAC Photogravure Technakohl Liner ~ Its a part of MAC's holiday collection. Really pretty dark brown color. Highly pigmented and glides smoothly. Comes handy while creating a brown smokey look. 16. Chambor Eye Dazzle Transferproof Smooth Eye Pencil in Silver Dazzle ~ Nice silver color. Go to 7. to read more. Writing quick reviews on 16 Colored Eye Pencils was not that quick I guess :P To see more Click HERE and HERE. p.s. All the above products are bought by my own money except for the L'Oreal Color Riche Le Kohl in Portofino Blue, sent by the brand for promotion without any obligation to review.